Site of the week is a new weekly feature highlighting an Irish website dedicated to wildlife, nature or conservation. 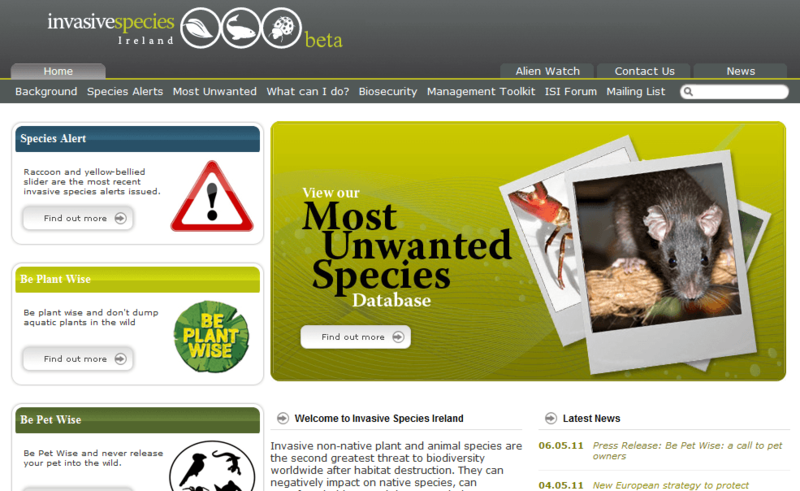 This week the featured site is Invasive Species Ireland – which works to highlight the threat posed to our wildlife by introduced invasive species. The introduction of non-native plant and animal species is the second biggest threat to global biodiversity after habitat destruction, so highlighting the dangers and encouraging the public to report invasive species is a crucial part of protecting Ireland’s biodiversity. Non-native species often have a negative impact on our native plants and animals… out-competing them for limited resources, preying on species that have never evolved defences to cope with foreign threats, introducing alien pathogens, compromising the genetic integrity of native species through hybridisation and even altering the composition of entire ecosystems, potentially wiping out the local flora and fauna. It sounds like an exaggeration… but the threat posed by invasive species really can’t be over-stated. To find out more, and to discover ways that you can help protect our native biodiversity visit the Invasive Species Ireland website.